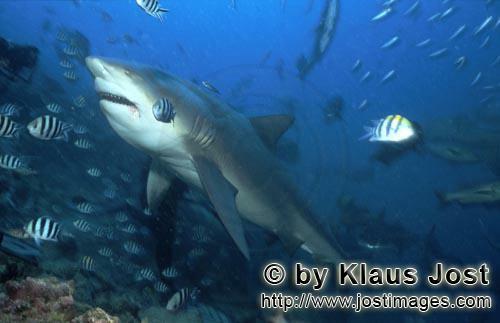 At the Fiji Shark Reef off the southern coast of Viti Levu in the South Pacific you come across many shark species. The diving tourism - part of the reef is legally protected - has become an important protection factor for sharks in this location. Sharks are guaranteed by means of fish bait, and at each dive I have also always come across Bull Sharks. The Swiss zoologist Dr. Juerg Brunnschweiler has been researching the migration movements of Bull Sharks in this location since 2004. During several weeks in February 2007, among other things it has also been my task to compile a photo documentation of the Bull Sharks for the scientist as well as for the Shark Foundation. Unfortunately, the visibilty under water was not good due to unfavourable weather conditions. However, at my second-last dive everything went well. When I only had a few photos left, this big Bull Shark passed me with a peculiar expression and ascended diagonally.